Authors should watch their words. The conference submission has been accepted. Your paper will appear at the conference! The co-authors have congratulated each other, and you are looking forward to the event. Your work, however, is not yet done. You want a highly polished product so that people enjoy reading your paper, understand it, remember it, and, yes, use it, hopefully, citing it in their own work. Achieving the goal of making your already-great-work perfect requires investing time and effort into preparing your camera ready. The art of the camera ready paper is more complex than it may seem. It requires attention to both content and form. You are at the same time adapting the paper to take the comments of the reviewers into account, and also beating the paper into perfect compliance with formatting requirements and editing conventions. During this process you must step back from your work, and look at it as other people would see it. While you are switching your brain between these different perspectives, it is helpful to have a checklist to keep you from forgetting anything that you would kick yourself for afterwards. In this post, I list ten points that I like to check through just before uploading the final version of the camera ready. Did you give your best effort to accommodate the reviewers' comments? Even if the paper will not be re-checked by a reviewer or an editor, it is important to get as much as possible out of what the reviewers have written. Their perspective gives you insight in what your readers need in order to be able to understand your paper, and to be convinced that it makes a compelling case. Did you check for issues that the reviewers missed? Reviewers are not perfect. At the end of the day, if your paper is not correct, consistent, and understandable, the reader will blame you, the author, and not the reviewers. Read the paper with "readers' eyes", and look for gaps, where a piece of information is necessary to understand the paper, but was omitted in the originally submitted version. Here, it particularly helps to check the captions of the tables and the figures. Readers often skim these in order to get an overall understanding of the approach and the results. The captions should be consistent with the text, and as complete as possible. Did you check the requirements of the conference proceedings? You will be required to use a specific template, and usually also to add a specific footer at the end of the first column. The conference creates a consistent, highly professional proceedings by imposing these restrictions: do not exercise your own creativity here. Did you check your metadata? The conference will often require you to copy-paste your title, authors, abstract and references into the camera ready submission system. These are used for preparing the program, and also for presenting your paper online. If you change the abstract, for example, you must also update the abstract version in the system. It's easy to forget. Did you de-blind thoroughly? 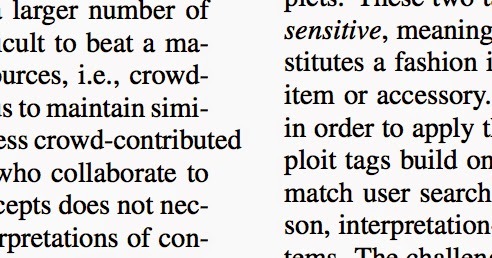 You probably anonymized your paper to submit it. But remember, you removed not only the authors names, but you probably also blinded your own citations in the reference list, and also any URLs leading to supporting resources. You need to add these back to the paper. Do not forget to now also add the acknowledgement of your funder or funders, and anyone else that contributed to the paper. Did you check for consistency in your terminology? Writing a paper is like writing code. When you declare a variable, then you must use it consistently throughout the paper. For example, if you decide to use a term as a proper noun and capitalize it, e.g., "Support Vector Machine", you need to keep it capitalized throughout the paper. You can use your favorite web search engine to check which form is more widely used, if you are uncertain. You readers are, obviously, not going to return a compile error if you are not consistent. But they will get a funny feeling that something is not right with your paper. A common problem is with hyphenated forms. For example, you should on "crowdsourcing" or "crowd-sourcing" at the onset of the paper and not switch back and forth between the two forms. People often get confused about consistency when it comes to hyphens. If you just look at word strings you will see two forms in papers. For example, in our papers on deep links, you will see both the string "deep link" and the string "deep-link". Look a little closer---consistency is not being violated. The form "deep-link" is hyphenated because it is being used as noun+noun modifier, as in "deep-link comments". If there is no following noun, then the paper uses "deep link". Did you check your spelling and grammar? It seems obvious, but in the rush it is possible to forget. It is helpful if you are writing .tex to go out of your way to put your text through a grammar checker to look for mismatches in subject/verb agreement, misplaced adverbs, and run-on sentences. A kludge if your do not have a grammar checker is to copy paste into another editor (e.g., Word) and ignore the errors created by the .tex mark-up. You should understand for each sentence that the grammar checker flags, why it is flagged. As the human writer, you have the authority to decide to leave a sentence that the grammar checker does not like the way it is. For example, grammar checkers often have a allergy for passive sentences, i.e., they hate sentences whose grammatical subject is something other than the logical subject of the action. Sometimes, however, such sentences are necessary to keep two consecutive sentences clearly focused on a specific topic. You should be aware that there are many issues that the spell checker is probably not able to detect. For example: complement vs. compliment, or discreet vs. discrete. Another one is work vs. works. If you are a computer scientist (as opposed to a painter or other artist), when referring to the products of your efforts you need to use "work" as an uncountable noun. Just like you would automatically write "research" rather than "researches". You should never write "works", unless you are truly referring to works of art for some reason. Did you check your layout? For many conference proceedings, preparing the camera ready means that you are actually responsible for the typesetting of your paper. You should have some general knowledge of typesetting principles. An important one is to eliminate typesetting "widows and orphans", lines of text that are isolated at the bottom or the top of a page. It looks particularly bad when a section title is the last line on the page, and the body of the section starts on the next page. Your poor reader will be flipping back and forth to figure out what is going on. Also, as in the above illustration "watch your words" so that they do not wander into the columns. This is a problem with .tex. To fix your layout, you are going to need to rewrite your text just a bit (add or take out a few words). Most conferences also accept if you gently adjust the spacing to avoid typesetting problems. Another guideline that is important both from the content perspective and from the layout perspective is how you end your sections. A section (or a sub-section) should never end with a formula, or with a bulleted or enumerated list. Rather it should conclude with at least one line of conventional text that ties the information in the formula or the list to the topic of the paragraph in which it is contained. Did you check your punctuation? I like to quip that many authors who are not physically capable of typing a line of code without ending it with a required semi-colon, use papers to let their punctuation fantasies fly. The reality of the situation is that punctuation is not entirely discretionary, and authors should choose an existing set of conventions and apply them consistently. For example, in the dominant style, "e.g." and "i.e." are always followed by a comma. If you choose that style, it should apply to every instance of "e.g." and "i.e." in your paper. You should understand the difference between a hyphen, an en-dash, and an em-dash, and use them accordingly. Finally, if you are using automatic hyphenation, you need to watch to make sure that words that are not in the vocabulary of your hyphenater are treated properly. Words get hyphenated at syllable boundaries. Note that if your software is set to hyphenate another language, German for example, it will not handle English correctly. You should avoid leaving a syllable at the end of one line that will lead the reader to expect a completely different word. Such cases are generally referred to as "bad breaks". One that I encounter a lot is "Medi-aEval". Correctly, this must be broken over two lines as "Media-Eval". Did you check your references? Recently, I had a very interesting discussion with a student who had just finished writing an excellent master thesis---expect, the reference section was a mess. The same conference was cited in different references in different ways: with acronym, without acronym, with page numbers, without page numbers, with city, without city. Proper nouns in the titles of the paper had all been case flattened, i.e., "flickr" rather than "Flickr". I asked him why he had not fixed his references. He said "But I got the .tex from Google Scholar, it has to be right!" Looks like I discovered an area in which I have failed as a mentor. Or expressed differently, an area in which I can further try to push back against our human tendency to close our eyes and push the autopilot button, when someone offers us one. The perfectly curated reference section is deserving of a blog post of its own.